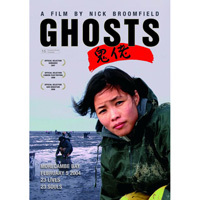 I saw the poster of Nick Broomfield’s Ghosts in Edinburgh’s Filmhouse cinema some time ago. There have been more press coverage when it released recently, but I wasn’t sure I could bring myself to watch this film. In the evening of 5th February 2004, I was travelling on a train from Manchester to Edinburgh along the west coast line. As in early February, it was dark outside. When I arrived home I heard the news about the missing Chinese cockle-pickers in Morecambe Bay. The next day it was clear 23 Chinese illegal immigrants were found dead or missing there. Looking at the map, I suddenly realised that on that cold February night, when my train was travelling in Lancashire countryside, I was not too far away from my fellow country men and women who were about to be swallowed by the rising tide.